I’m an aggressive feeder. Good luck getting out of my house without at least a handful of nuts and cured olives or a bag of granola to go. I love to feed people, and the people I feed can rest assured that with each meal I’m serving up, they’re getting a heaping plate of steaming love. I’d even go so far to say that cooking is my love language. Now I realize there are people out there who don’t care all that much about food, who view eating merely as a means of delivering life-sustaining nutrients, and who think the idea of showing love by cooking is preposterous. And to them I’d say this: preparing a meal takes time, costs money, and requires a lot of thought. Anyone who’s willing to brave long lines of hipsters at Whole Foods, endure all manner of physical injury from hot pans and sharp knives, and spend hours holed up in a stuffy kitchen to feed you, well, they definitely dig you. Thank them by making appreciative moaning noises as you eat their food; it’ll make their heart swell. I’ve been on a bit of a hiatus from Amy Burns the Recipe Book for the last couple of weeks. I lost a friend and co-worker, and the thought of shopping, preparing, and cooking hasn’t done it for me lately. I have two stress modes. The first, moderate stress, involves me seeking out as many refined carbs as possible and shoving them in my mouth. The second, good for my waistline but bad for my soul, finds me really, really stressed and without an appetite for food or a passion for cooking. I’ve been in the second camp these last weeks. But now I’m back with the type of recipe that really says I love you. 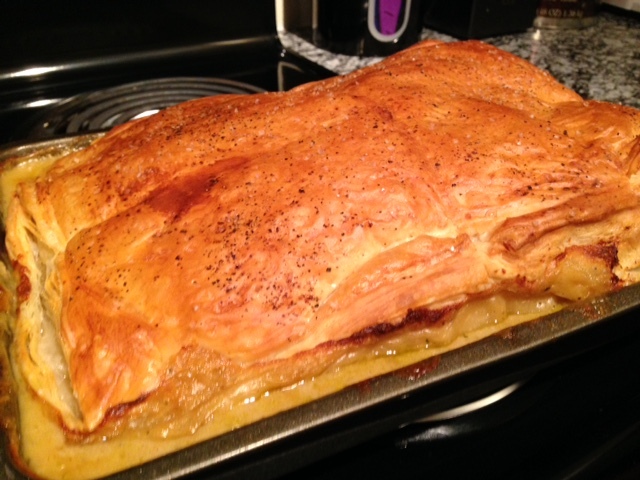 It’s extra good at delivering your message of affection because it contains gravy and puff pastry. Let’s be real people, salmon and salad can be spruced up and pretty tasty, but it’ll never say I love you like homemade chicken pot pie. I’m hoping that by making this recipe and sharing it with you, all the resultant love will take away a bit of my sadness. 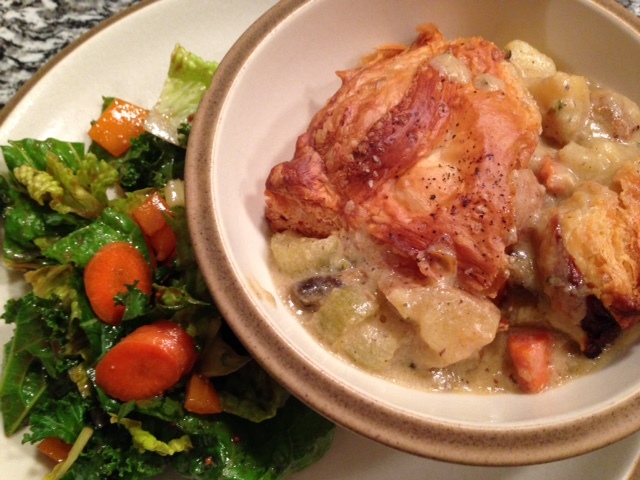 Oh and my friend Phil loved rich, creamy, homey dishes like chicken pot pie. Tomatoes and salad, not so much. This one’s for you. Preheat the oven to 350 degrees. Place the chicken breasts in a small roasting pan, drizzle with olive oil, and season liberally with salt and pepper. Bake for 20 minutes. Remove from oven and let cool completely before pulling the chicken into bite sized pieces. Place the chopped red potatoes in a medium stock pot and cook on high heat until fork tender, about 15 minutes. Drain and set aside. Increase the heat on the oven to 425 degrees. For the filling: Place 1 tablespoon olive oil in a large saucepan or Dutch oven over medium heat. 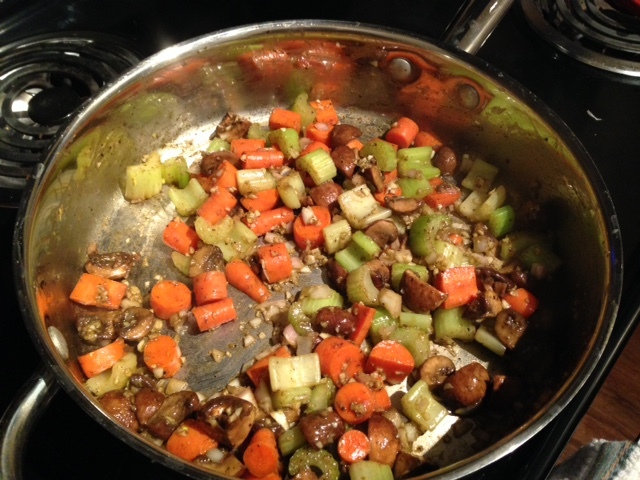 Add the mushrooms, celery, carrots, garlic, salt, pepper, and dried rosemary and thyme. Cook until the veggies are tender, about 15 minutes. Next add the butter to the pan and let melt. Once melted, sprinkle the flour over the veggie mixture and stir until incorporated. 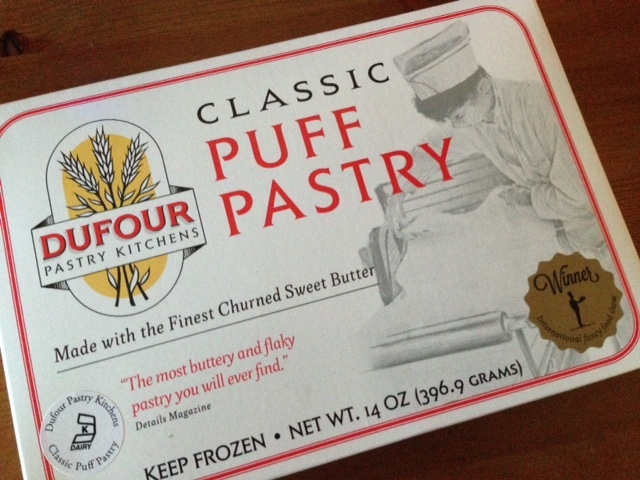 Let cook for about a minute or two to eliminate the taste of raw flour. Add the milk and chicken stock to the saucepan slowly, whisking to incorporate. Once the liquid is incorporated and the gravy is smooth, crank the heat up to high and let simmer until sauce has thickened enough to coat the back of a spoon, about 5-7 minutes. Take the pan off the stove and add the roasted chicken, cooked potatoes, fresh herbs, and more salt and pepper to taste. Pour the chicken stew mixture into a 9 x 13 pan. 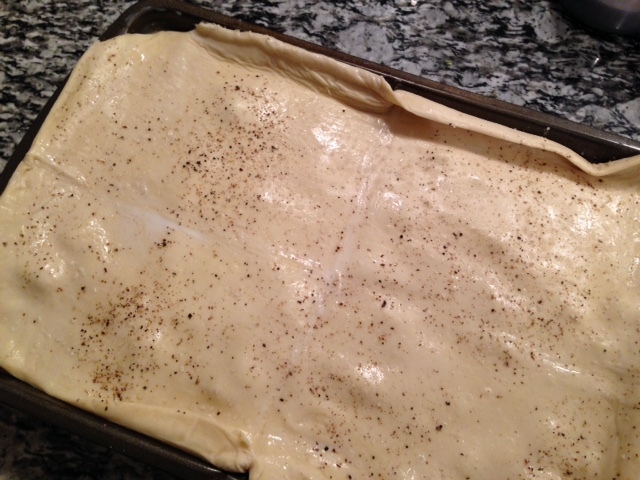 Cover the mixture with one sheet of the thawed puff pastry. Brush the pastry with 1-2 tablespoons of whole milk and sprinkle the top with ½ teaspoon of kosher salt and ¼ teaspoon black pepper. Bake for 20 minutes at 425 degrees. Decrease the heat to 400 degrees after 20 minutes and bake for another 30-40. Remove the dish from the oven and let cool for 15 minutes before cutting and serving.